Volleyball workout program tips and exercises important for developing strength and power for volleyball. 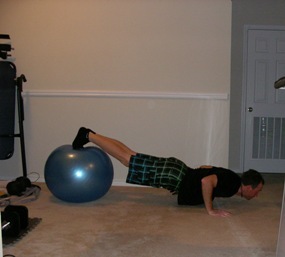 Core has become a popular buzzword in sports training and fitness industry. Countless articles and books have been written about how to produce six-pack abs. The core is more than just the abs. The core is the midsection of the body from hips to shoulders. The core is the basis for all movement. 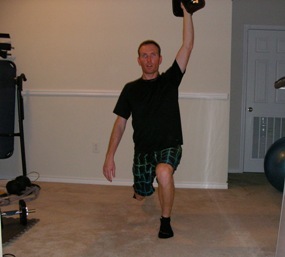 Hip, core, and shoulder stability is known as pillar strength. 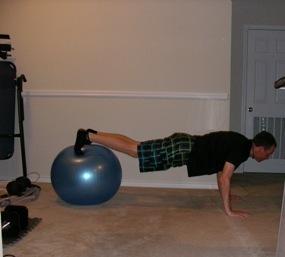 Core training will improve your balance, agility, timing, speed, endurance, and power. If you think of your body as a wheel, the pillar is the hub, and the limbs are spokes. If the hub is perfectly aligned, we can draw energy from it. We draw energy from it and effectively transfer energy throughout the body. 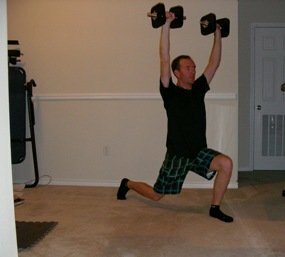 It's impossible to move the limbs (your arms) efficiently and forcefully if they're not attached to something solid and stable. When you spike a volleyball, you're not just using muscles in your arms. Powerful spikes are the result of a strong powerful core. The reason we focus on training volleyball movements and not body parts is because everything about the body's engineering is connected. If there is dysfunction at one area of the body, other areas are affected. 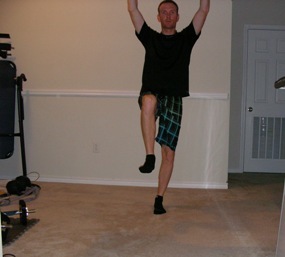 For example, if you have an injured big toe, this will affect the knees, the hips, and ultimately the shoulders. 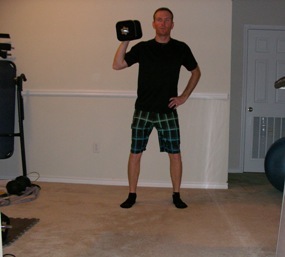 Many volleyball workout programs do more harm than good by producing muscle imbalances and inefficient movement patterns that sabotage your highly coordinated operating system you were born with. Developing Core Strength - It's more than just training the abs. Core strength training is not just about the abs. The abs are less than 1/3 of the equation. Abdominal exercises are of little use for volleyball unless done in conjunction with exercises aimed at integrating your shoulders and hips. The muscles of the core will become strong and stable with the right types of recruitment patterns that will enable them to work in tandem with the shoulders and hips. 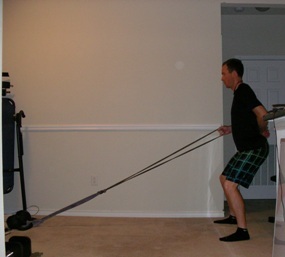 The core transfers energy from lower to upper body and vice versa. The key is recruiting muscles in the right sequence, training the whole body as an integrated system rather than isolated parts. Your core muscles are the body's engine, and most movements initiate from there. Your volleyball strength and conditioning program should include exercises specific for improving volleyball core strength and power. 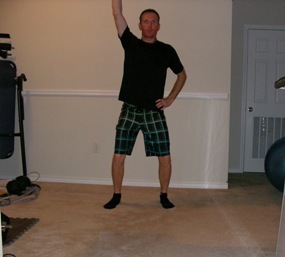 This is a great total body exercise to add to your volleyball workout program. Keep shoulders back and over the hips. Chest should be up and out. Try not to push off too much with the opposite leg and make sure to control yourself as you step back down to the ground. 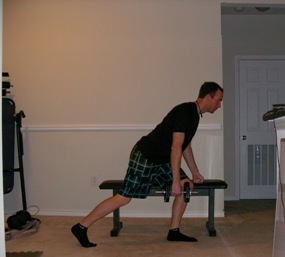 This version of the row is much harder than the dumbbell row using a bench as support. 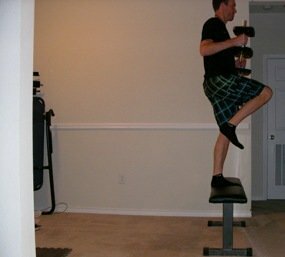 An even more difficult progression would be to put the opposite hand on knee. 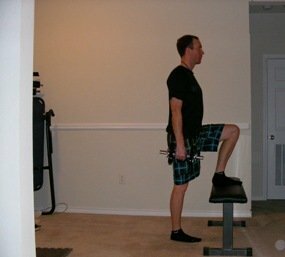 This variation is very challenging because you must use your own core and body to support yourself instead of leaning against a bench. 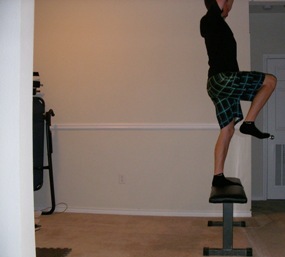 This exercise works the shoulders while utilizing leg and core strength. The alternating action of both the arms and legs requires coordination, timing, and balance - qualities that are essential for movements in volleyball. 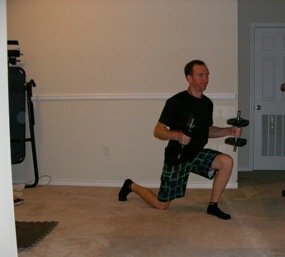 Start out with light weight and focus on perfect form. 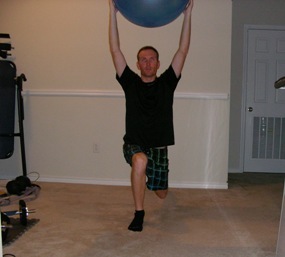 You're going to feel a good hip flexor stretch as well as a challenged core stability. 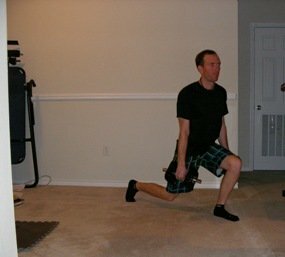 Both of these add to the already valuable leg strength lunges provide. 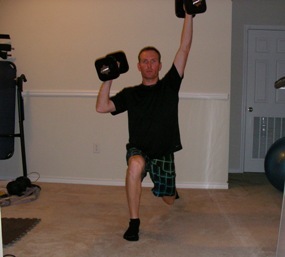 This exercise is challenging the body from head to toe. 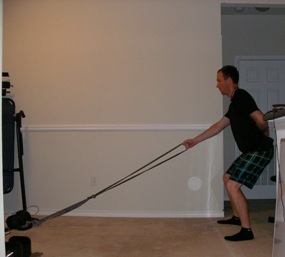 It's usually difficult to keep the arms straight, so we focus on pressing the ball upwards while lunging forward. 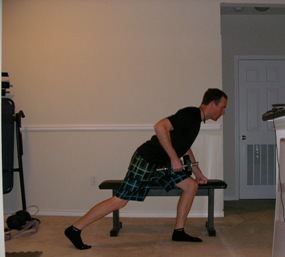 This exercise develops power and timing, provides an eccentric overload, and forces the athlete to brace on the opposite side. Be sure to stay level and don't cheat by leaning towards the unloaded side.